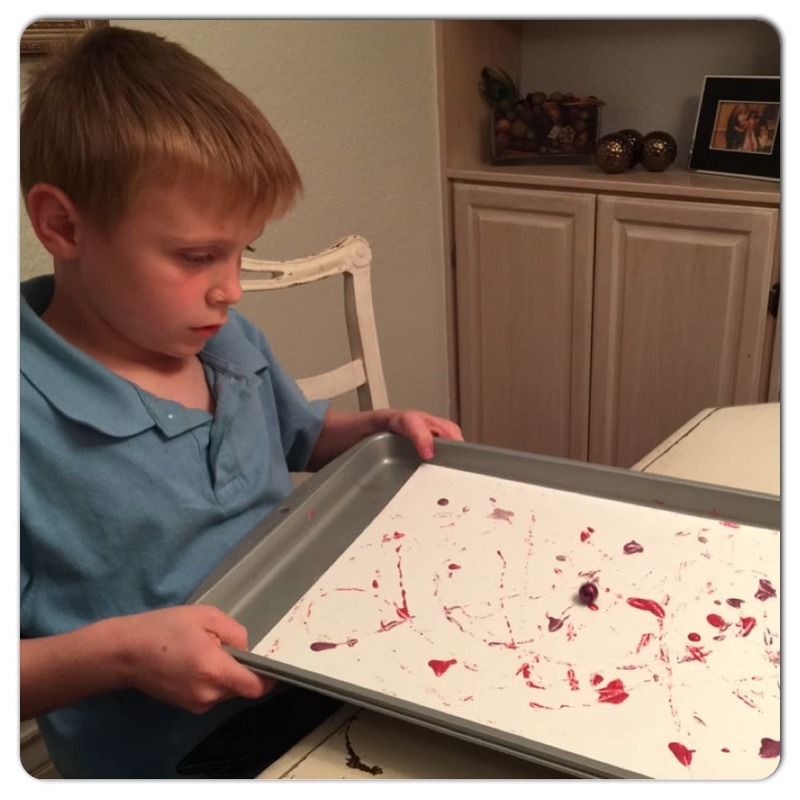 One of my favorite pass times is being creative and doing arts and crafts with my kids. I guess you can blame it on being left brained! Once creative, always creative! Since writing for my blog on almost a daily basis, our family’s arts and crafts times had been put to the back burner for a while. The kids still colored and glued and turned my house into a craft lover’s paradise, but me…not so much! I missed it a lot! Therefore, yesterday, I decided it was about high time that our entire family started crafting again. The first project my children and I got rolling on (literally!) was Marble Painting. 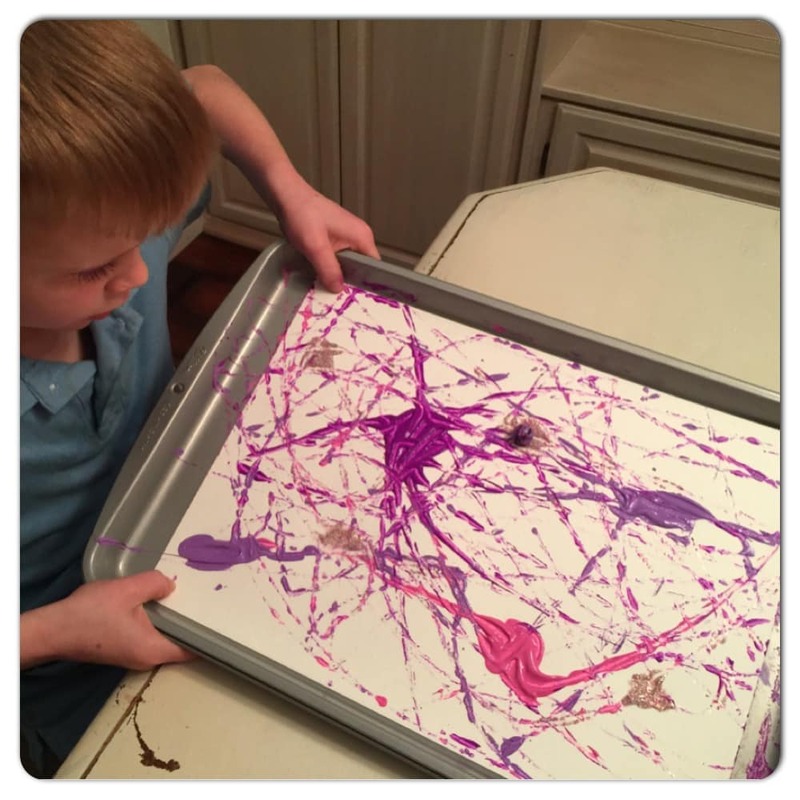 Marble Painting is as easy as it gets when it comes to crafting. 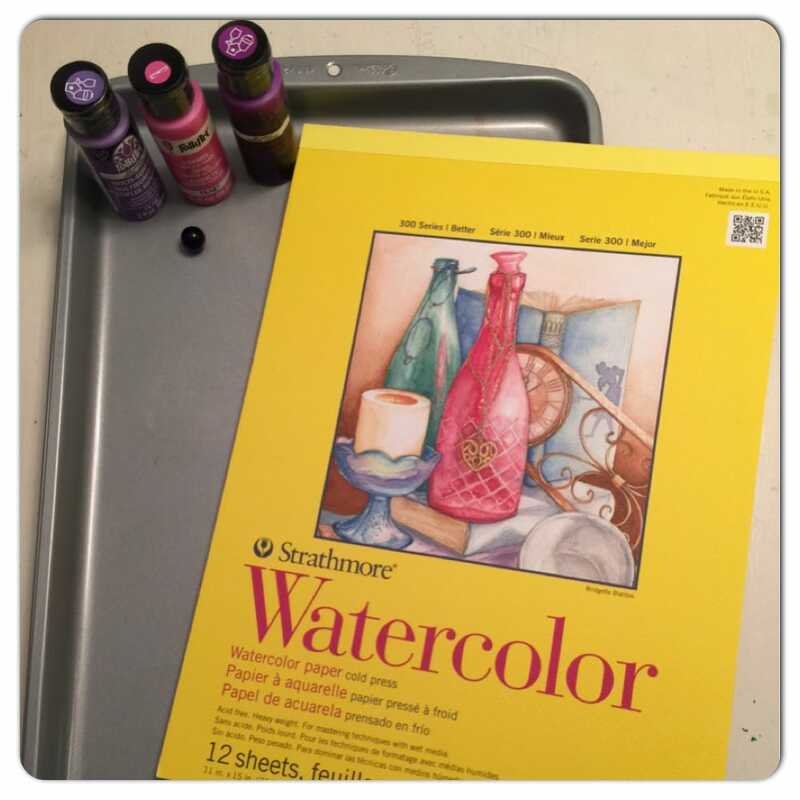 Only four simple items are needed – acrylic paint, a marble, watercolor art paper and a cookie sheet. 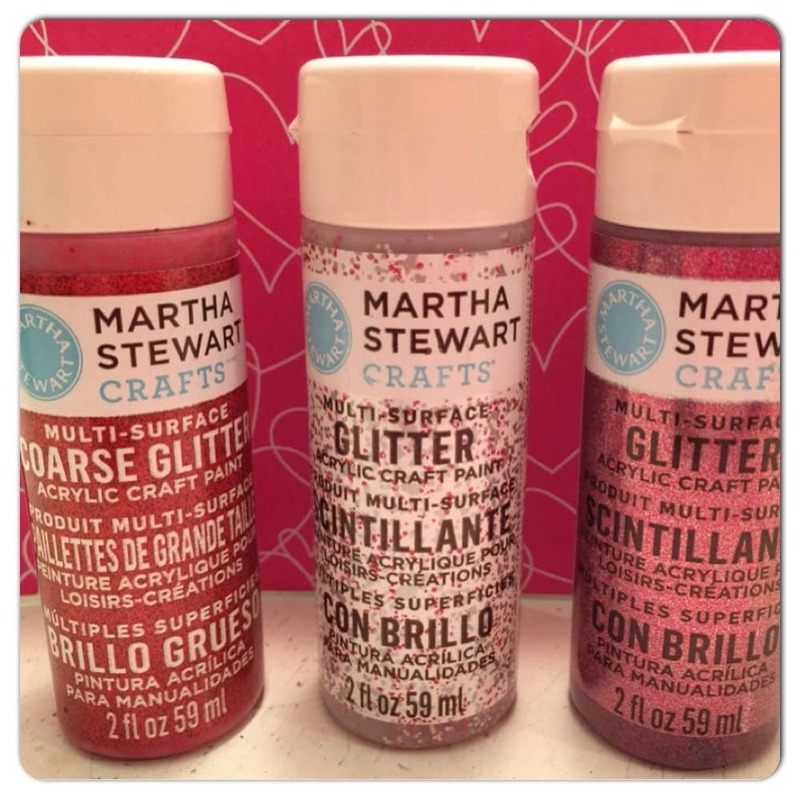 I chose to use Plaid’s folkArt Acrylic Paint and Martha Stewart Crafts’ Multi-Surface Glitter Acrylic Craft Paint for this project, because it was close to Valentine’s Day. 1. First, put a piece of watercolor paper (I got mine at Michael’s Crafts Stores) on the cookie sheet. 2, Next, add a few drops of acrylic paint (whatever colors you want depending upon the season) onto the paper. 3. Finally, put a marble on the paper and swirl it around in the paint. 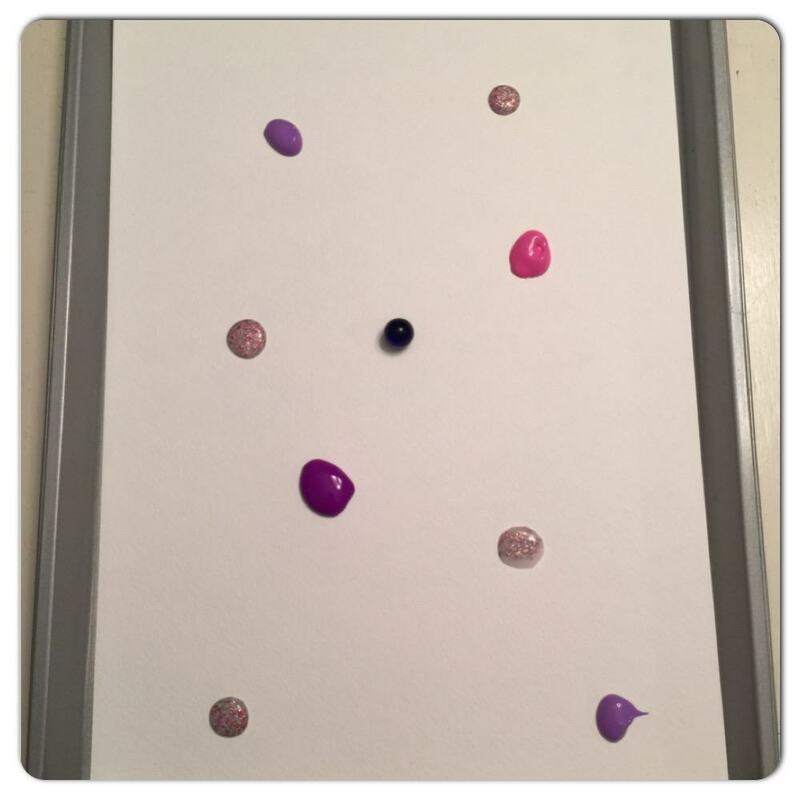 You can also use different size marbles if you want to. It’s that easy! 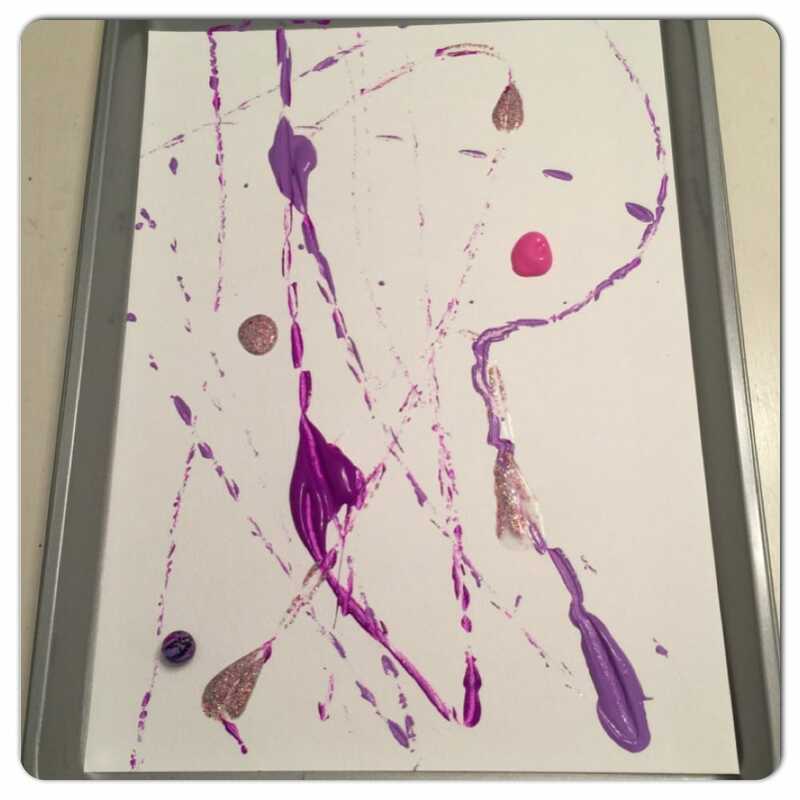 The last time we did marble painting, I used the top of a cardboard box to roll the marble around. However, since I didn’t have one this time, I improvised by using a cookie sheet. 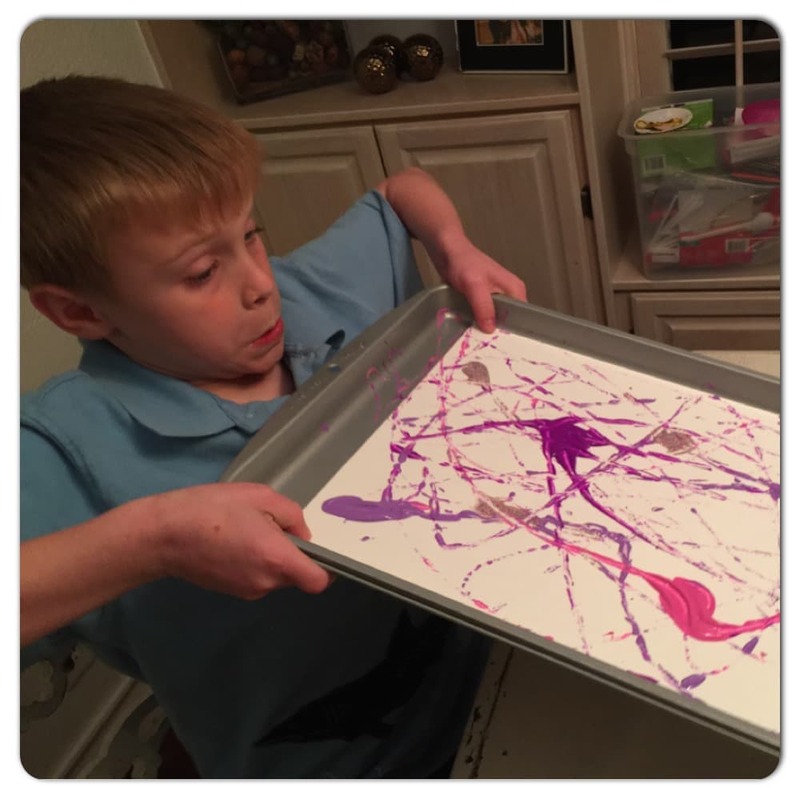 It turned out to be a fun challenge for Field Trip Boy as he tried to keep the marble on the cookie sheet. Just take a look at his face! Field Trip Boy and I came up with all sorts of marble painting concoctions. 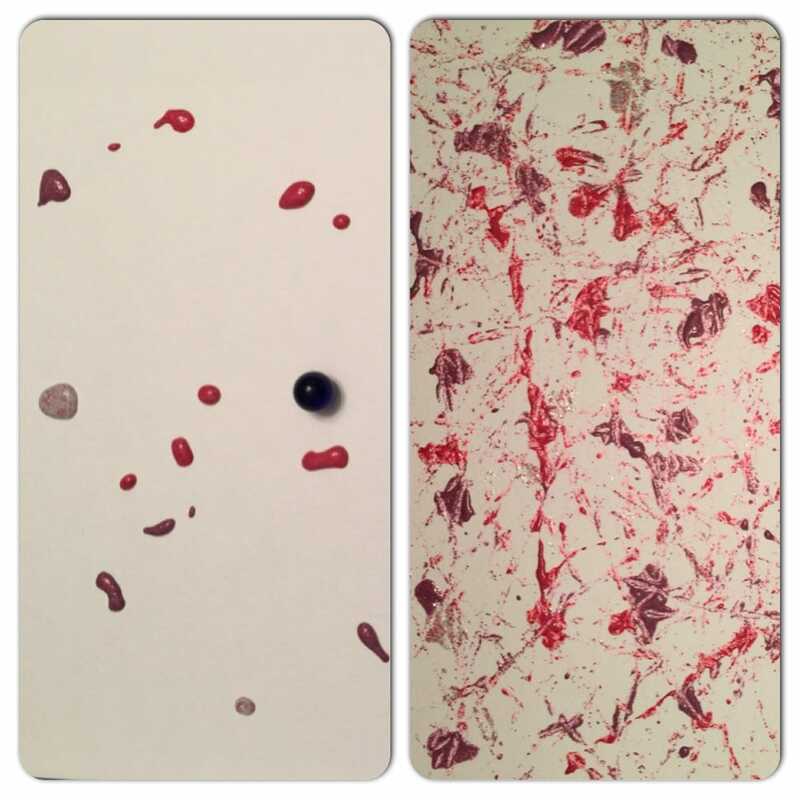 We tried different color patterns, different paint textures and even different ways to roll the marble around. 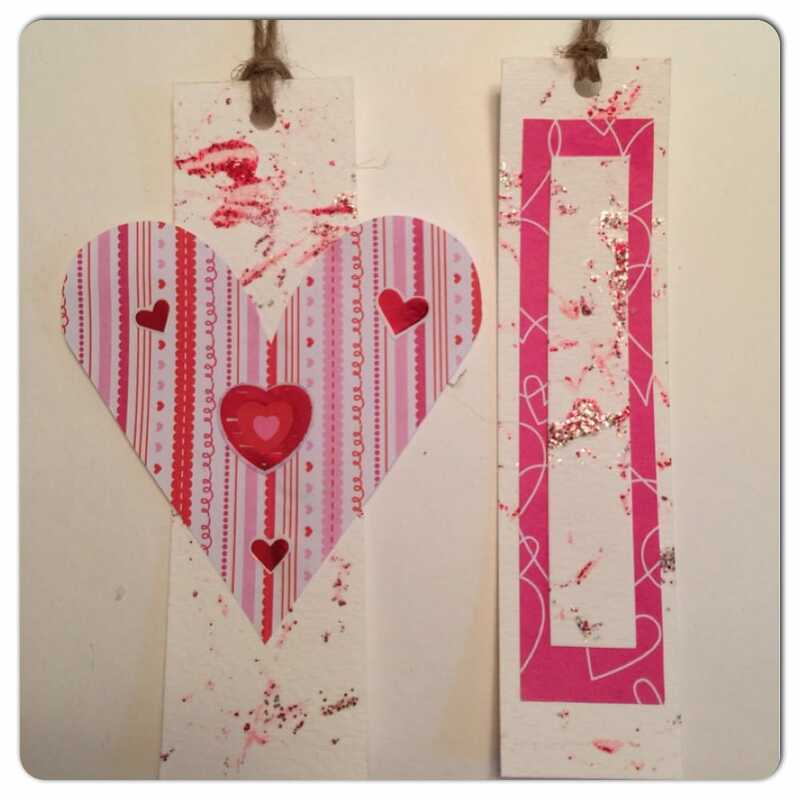 After the paper dried I decided to create some quick and easy Valentine’s cards with it. 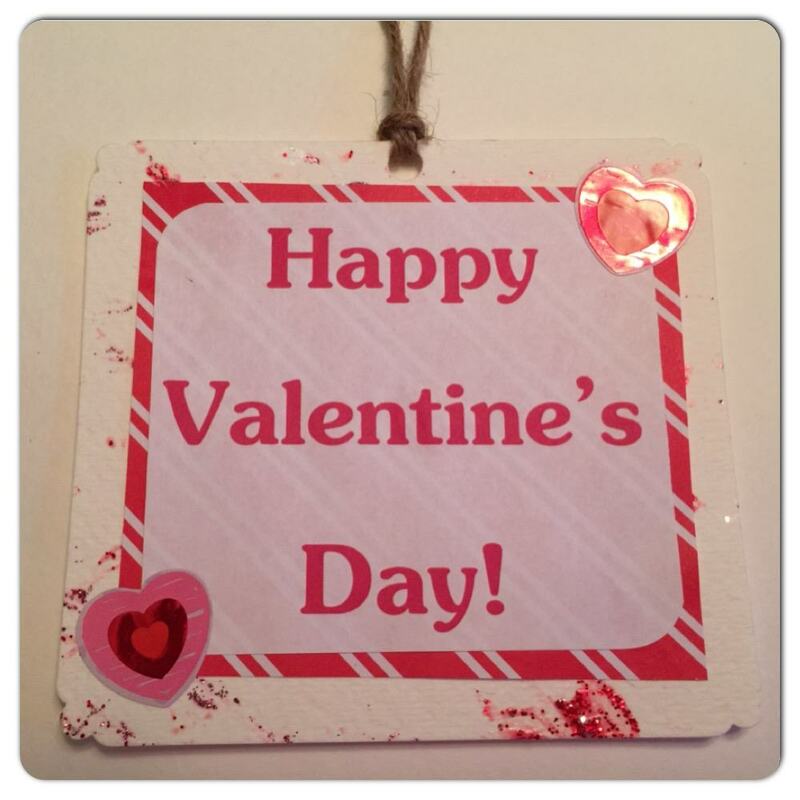 We plan to send these cards to grandma and grandpa this year for Valentine’s Day! They love homemade presents just as much as we do. What a cute idea! We have to try this! It was super fun and easy peasy! How fun! My daughter would have a blast doing this craft. 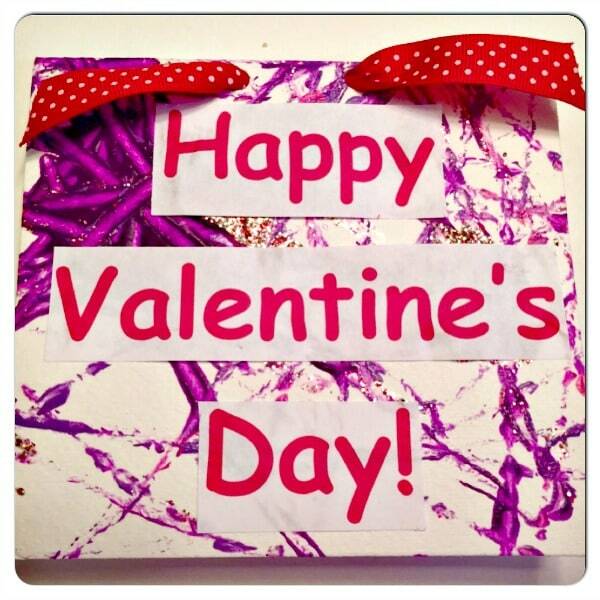 We might try it for making Valentine’s cards for her grandparents. I may have to try it myself!! Thank you Mary! 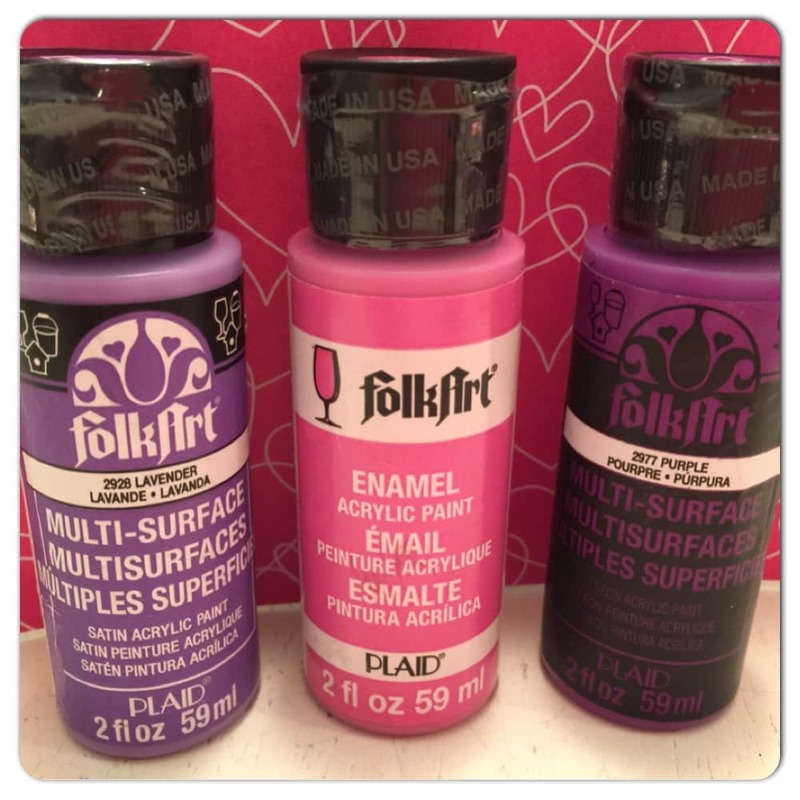 It is super easy and super fun. It is quick and easy too, I promise! That looks like so much fun! We’re in the stage where marble would go in her mouth, but I think this could be done with a ping pong ball! Going to try it! Thanks! Oh Trina! A ping pong ball is a great idea. Perhaps a golf ball might work too since it is heavier. Just watch though. That could go in the mouth too. Perhaps a tennis ball and doing it outside would be even better on the grass on a cardboard box. Just dreaming now! I wish I had little ones to try this with! My youngest may still try it with me though and I bet my older daughters still would, especially for maybe things like thank you notes, since we make a lot of our own cards. Thanks for sharing! Thank you Donna! Do you know you can make stationary out of ironing gift wrap onto wax paper too? I might do a post about that someday. So fun! 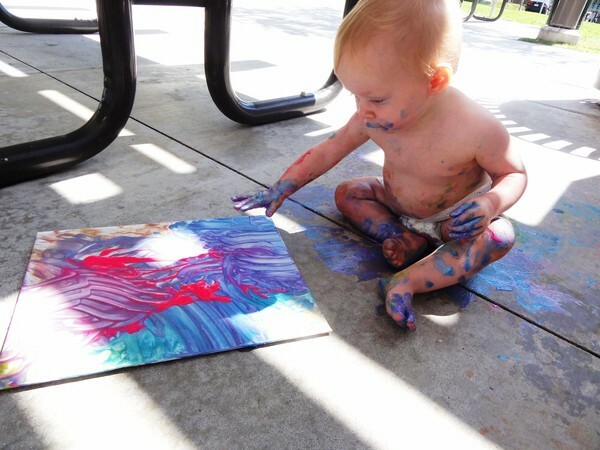 I love the baby pic of her first art project! adorable!